Finally got an idea for the "Irma feature"! Today's such a great day in my home town that it just sparked my creativity. Yey for the weather! Here's a super rough doodle that started it. Quick reminder: The 2-pages feature of Irma is the start of the new adventure. It's NOT a short story. 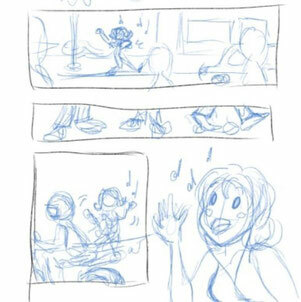 It was so much fun drawing Irma dancing and singing, jumping and moving through the streets that I drew 2 full pages with just that. It would be so typical for her to just do that for two whole pages but... I guess you guys who voted for her would feel cheated so I came up with something else. There will still be some dancing though. Just because!